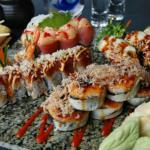 a relaxed casual environment where you can dine with friends and family and enjoy the pleasures of fresh sushi. Lunch Mon-Sat 11:30 a.m - 2:30 p.m.
Dinner Mon-Thurs. 4:30 - 9:00 Fri/Sat until 9:30 p.m.